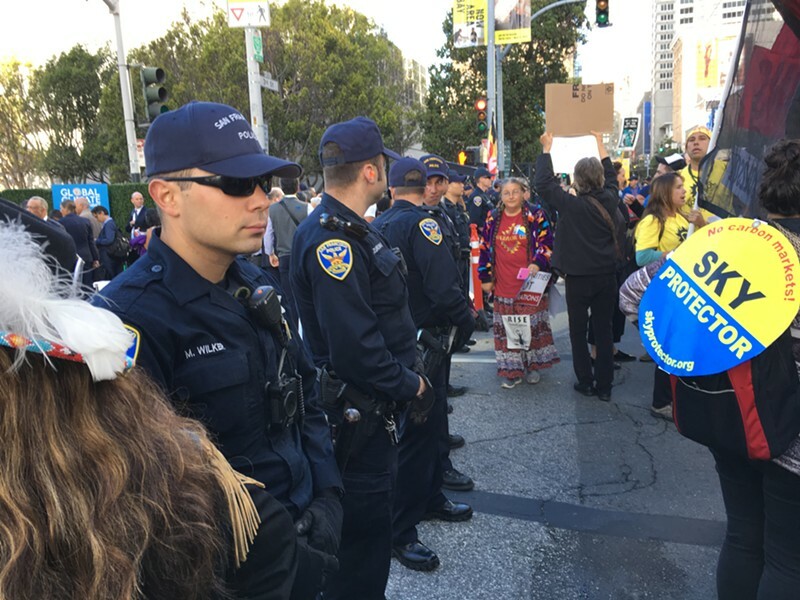 Police and protesters meet in the streets outside the last week's Global Climate Action Summit. Have no fear—the end is not near, or here. Victory is ours, Earthlings. Or so the website for the Global Climate Action Summit declared at the end of a week-long series of panels, talks, interviews and informal conversations that brought together dozens of official delegates and hundreds of observers from Asia, Africa, Europe and the Americas. The web text reads, “The tide has turned in the race against climate change.” That was news to me, especially after I listened to dozens of speeches during a couple of daylong marathon sessions last week. It is true that I was stoned for much of the proceedings. Before I arrived at the Moscone Center on Third Street in San Francisco I enjoyed a legal edible from the Garden Society. The instructions on the package advised that it might take up to two hours for the edible take effect, but the cannabis-laced chocolate kicked in in less than 30 minutes—and lasted five hours. Having altered my own inner climate, which was far easier to do than reverse global climate change, I was cool enough, calm enough and collected enough to enjoy the likes of actor Alec Baldwin; chimpanzee champion Jane Goodall; New York City Mayor Bill de Blasio; former U.S. Senator John Kerry (who helped negotiate the Paris Accords); and a woman from north of the Arctic Circle who explained to me that she and the tribes of the north, and the polar bears, too, have “a right to ice,” which is now threatened by global warming. If the tribes above the Arctic Circle had a right to ice, I figured I had a right to be high at the Global Climate Action Summit, and to do my best to channel Dr. Hunter S. Thompson—who no doubt would have skewered this event in much the same way the late gonzo journalist skewered the Kentucky Derby and various Republican and Democratic conventions. Let’s start with the sponsors: Bank of America, Kaiser Permanente, Google, Facebook and Amazon. A friend in the city who had offered me a bed for the week, told me as I was leaving his house to go to the Moscone Center, “This whole event is about green capitalism.” I thought about his comment on the N-Judah street car and on the line waiting to get inside the Moscone Center. “Is this event about green capitalism?” I asked Shashi Menon, CEO of a corporation in Iowa that’s developing biofuels. Menon gave me an unambiguous answer. I didn’t hear anyone inside the Moscone Center mention the words “socialism” or “communism” though a member of the Central Committee of the Revolutionary Communism Party, who was protesting in the street, handed me a brochure entitled “How We Can Really Make Revolution” in which I read “The system of capitalism-imperialism cannot be reformed.” No one inside the Moscone Center wanted a revolution of the sort that the Revolutionary Communist Party had in mind. What sane person would? Communism, Russia style, had been a disaster for the environment and for human beings, too. What delegates and participants wanted most of all was to survive the kind of storms that were battering the Philippines and that would soon batter the Eastern Seaboard of the United States. Former Vice President Al Gore, who spoke like a man on fire, explained to the audience that, “we are in the early stage of the sustainability revolution which will be as profound as the industrial and the digital revolutions of the past.” Gore lashed out at “heat stress,” “rain bombs and “mud slides,” and lamented the fact that there were “millions of climate refugees” around the world. If there was a new president in Washington D.C., the U.S. would rejoin the Paris accords, Gore predicted. “We have the political will,” he said. Jane Goodall has moved on from chimps in Africa. Now, she travels around the world and talks about the need to save forests that are destroyed by the timber industry, and to make way for agriculture, to grow more grains, feed more cattle and produce more beef. The panel of mayors from four continents was a study in contrasts. Annie Hidalgo, from Paris, was the best dressed of the lot—her white high-heeled shoes stole the show—and her smile was infectious, too, though Zandile Gumede, the Mayor of Durban in South Africa looked stunning in the tradition garb for women in her society. Before he walked off the stage, Matthews told the audience that he and Jane Goodall were “going off to drink Scotch.” If they had invited me I would not have had to think twice. But I was okay. I was still stoned, and I was ready to join Jane Goodall, become a vegetarian and do what I could do to restore our deforested planet. No, I wasn’t a revolutionary. I was merely a restorationist and proud to be one.